1. What made you start writing and why were you drawn to that genre? I always loved reading, and I had writing at the back of my mind for a long while, but it wasn't until I was in my forties that I started to seriously think of plots, and start putting ideas down on paper. I wasn't originally drawn to the crime genre; I just sort of gravitated to it, but I've read a fair bit of crime from all over the world, and I've really enjoyed writing crime stories. 2. Blue Wicked is your second book, how does it compare to your first? The first book wasn't really written as a crime story. It's as much about the relationship between the cabinetmaker of the title, and the young policeman who investigates his son's murder. It was put into the crime bracket when I first published it and it was probably too much of a slow burner, so although it was well received, a lot of reviewers commented that some parts seemed to drag a bit. 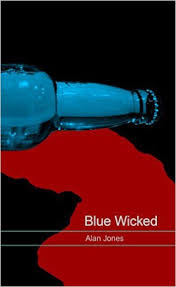 When I started Blue Wicked, I was writing it as an out and out crime novel, so I tried to keep the pace much more consistent, while still allowing for the character development that I love. 3. Is any of the characters based on people you know? Eddie has aspects of a few people I have known through work, and some of the others may have little bits of people I have met as well. I have come across people who would do such despicable things to animals, so some of the bad stuff in the book will have come from that. 4. Why did you choose the location for your book(s)? The Cabinetmaker was set in the West End of Glasgow because I knew it so well. I wasn't just so familiar with the South side of Glasgow , but I wanted to stay in the city for the story so I did a bit of research and came up with the locations that suited it perfectly. The language and humour of Glasgow is just fantastic for writing crime, so it was an easy choice to make. 5. What is next for Alan Jones? 6. Do you have any book events planned? I've applied for slots at a couple of crime festivals but I write under a pseudonym to keep my identity secret, so I might have to go in disguise! We did a couple of street cabinetmaking events, including one at last year's Bloody Scotland, to publicise my first book, and we may do one more if an audiobook ever gets released. I'd love to do a few small book club events in central Scotland, so if there are any local book clubs who would like a reading or a Q&A session, they can contact me on Facebook, Twitter or via my website. 7. Are you reading anything just now and if not, what if your favourite genre to read? I love reading a variety of genres. I've just finished Blood Tears by Michael J Malone and really enjoyed it. I'm struggling to find reading time at the moment with all the writing and promoting stuff that's going on, but I have a week's holiday in the sun coming up, and I have a selection of books on my kindle which I hope to make inroads into. I also want to read the latest book from Irvine Welsh, who is one of my favourite authors. Thanks to Alan for taking time out to answer some questions. You can read my review of Blue Wicked here, and up for grabs is one signed paperback copy. As always, we use the Rafflecopter widget, you can enter by selecting options below. Good luck and thank you for stopping by. Great interview! loved reading Bloq! Heard of the contest via subscription post. I heard about the competition from a friend - always on the look out for new books!